UN Ambassador Nikki Haley, whose parents immigrated to the United States from India, took a swipe at Massachusetts Senator Elizabeth Warren during a speech Thursday night. "I get it. 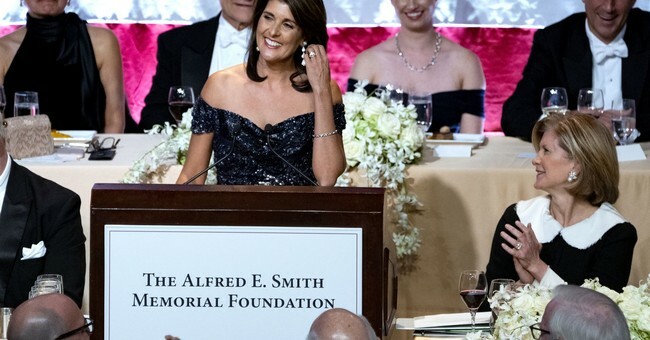 You wanted an Indian woman, but Elizabeth Warren failed her DNA test," Haley said in jest at the annual Al Smith Dinner, where speakers are known for roasts. "Actually, when the President found out that I was Indian-American, he asked if I was from the same tribe as Elizabeth Warren." Haley also poked fun at herself, took on convicted felon Paul Manafort and lamented being a conservative in New York City. "With all of our differences, there is still one thing that unites all 193 countries. At one point, every single one of them was paying Paul Manafort," she joked. "People always wonder if I felt different or isolated as an Indian-American growing up in rural South Carolina. Actually, there was a benefit. It totally prepared me for being a Republican in New York." Haley announced her resignation as UN Ambassador last week during a meeting with President Trump at the White House and will leave her post by the end of the year. "I have given everything I've got these last eight years, and I do think something it's good to rotate in other people who can put that same energy and power into it. A lot of people are going to say there's a lot of reasons why I'm leaving," Haley said. "The truth is, I want to make sure this administration, the president has the strongest person to fight. It was blessing to go into the U.N. with body armor every day. I'll never truly step aside from fighting for our country." The President is expected to announce her replacement in the coming weeks.